While some men would prefer to forget all about 1970's disco fashion, this memorable decade spouted casual attitudes and new style of music. When John Travolta strutted down the street in the film Saturday Night Fever, he gave disco-loving men everywhere license to wear the bold, dramatic styles of the time that translated well to the dance club floor. Men's casual fashion began to loosen up during the 1960's, but when disco music hit the scene in the 1970's, a new era in men's style was born. Young and old alike flocked to disco clubs to dance the nights away. Men's fashions paralleled women's fashions during this time. Just as female dancers wore bold, dramatic styles on the dance floor, male dancers' flashy clothing rivaled the way women dressed. Stretchy fabrics: Polyester saw huge success during this decade. 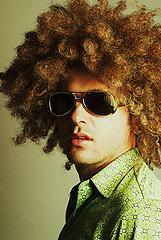 With the addition of stretchy materials like lycra or spandex, men's 1970's disco fashion often fit close. It was typical to see a guy sporting a polyester shirt, fitting tightly across the chest, being unbuttoned halfway down and paired with pants that fit close in the rear and upper legs. Bold patterns: Many of the shirts men wore to the disco were classified as "busy" in their patterns. From geometric designs to unique patterns never before seen, tops were anything but plain. Nowdays, designs easily identify an authentic shirt from the 1970's. Widely flared pant legs: The boot-cut pants of today have nothing on the flare in men's pants from the 1970's. Those slacks bear no resemblance to the baggy trousers of today. The thigh area might fit closely, but once below the knees, the pants took a dramatic flare. It was no trouble to wear boots beneath these wide-legged trousers. Wide lapels: Along with wide pant legs went wide collars and lapels, mostly seen in men's suits as well as their casual and dance attire. When going to nightclubs, many men wore shirts with buttons undone halfway down, sometimes even further. Dramatic colors: Just as the patterns were bold and dramatic, so were the colors that men wore when going to the disco. With such a wild and carefree atmosphere at well-known clubs like Studio 54, no one wanted to fade into the background when disco dancing. While women made great use of color and shiny fabrics and materials for their 1970's disco fashion, men relied on bold color in their clothing. For the most part, disco fashion visibly separated itself from everyday clothing. Although wide lapels and polyester were part of just about everyone's wardrobes, the flashier elements were typically reserved for the disco. Men's and women's styles tended to blend together during this time, which hadn't occurred during previous decades. The disco culture encouraged less-defined gender roles, which also resulted because of the recent women's lib movement. Most men today wouldn't be caught dead in the polyester and patterned fashions of the 1970's. However, in the event you have a costume party to attend, a selection of these vintage styles are available from auction sites like eBay and consignment stores in your area. Ask your dad or other relative if he still has some of his disco clothing from the time. They'll probably be more than happy to lend it to you.